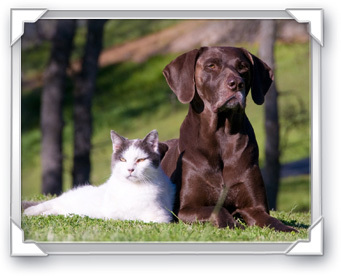 For more than 30 years Chesterfield Veterinary Center in Chesterfield, Missouri has offered complete veterinary care to pets and pet owners in Chesterfield, and throughout St. Louis. As a full service animal hospital, we are dedicated to providing the best that modern veterinary medicine has to offer by a skilled staff that is professional and courteous. Founded in 1974, we have continually strived to ensure our hospital remains at the cutting edge of veterinary care. In 1997, Dr. Flasar expanded the hospital in order to update its resources and expand our care offerings. Then in 2011, we recognized the need for a more modern facility that would better meet the needs of our growing practice. Our new facility has a state-of-the-art surgical suite, updated treatment areas, a comprehensive laboratory, a complete veterinary pharmacy, four large private exam rooms with lift tables for large dogs, a welcoming and comfortable boarding area, and more. Our new veterinary facility is also fully equipped to meet the varied healthcare needs of our clients' pets. We offer complete wellness care founded on the principle that preventative care is the best means to protect the wellbeing of your pet while minimizing the lifetime cost of care. This includes routine physical exams, lab work, nutritional counseling, specialized care for senior aged pets, appropriate vaccines, lost pet microchip ID, and a variety of other services. Should your pet require medical or surgical care, the skill and expertise of our doctors are enhanced by advanced diagnostic imaging equipment, in-house medical testing capabilities, a modern surgical suite, and a wide range of veterinary specialty resources. However, a modern veterinary hospital is more than its equipment, skills and the collective experience of its staff. We are pet owners ourselves and understand how important your pet is to your family. We also understand how important it is to you that your pet receives veterinary care from professionals within a friendly and welcoming environment where your questions and opinions are respected. Our doctors and staff believe that our medical expertise and love for animals is of little use if we do not share that with you. We believe that client education is an important aspect of the work that we do and part of our mission to improve the human/animal bond as well as responsible pet ownership. When you come for a visit with your pet, we will listen to your concerns and provide you with the latest information on caring for your type and breed of pet. Please browse our website, read through our services and why we believe they are important, and read through our doctor bios to learn more about our team of professionals. If you have any questions or would like to schedule an appointment, please feel free to give us a call today.